Carnival 2009 was noteworthy in some respects. For example, the only cold weather of the season occurred during the second Carnival weekend, not the first weekend. 2009 was the 100th anniversary of the Zulu organization, and was also the 50th anniversary of the Mardi Gras Doubloon, an anodized aluminum ‘coin’ that had the krewe logo on one side and the parade theme on the other. Rex was the first krewe to throw doubloons 50 years ago. The doubloon also changed the economics of krewes- it was the first throw that the krewe could sell to its members for a small profit, thereby adding a important revenue source for all krewes. 2009 was the year that electric light up beads became almost commonplace. Krewe du Vieux: KdV was big, brash, and more biting than anyone else (rated M for mature) in its satire. The floats are mule drawn, and they have more brass bands than anyone else- seventeen in 2009. They are the only krewe to march in the French Quarter and Faubourg Marigny. KdV is the only adult themed krewe to march down the streets of New Orleans. I love KdV but I’m partial because I am in KdV. Oshun, Pygmalion and Ponchartain are small parades, but the first of the season to travel down St. Charles Avenue, and therefore very very welcome. Ponchartrain used to parade in the Lakeview area. I’ve always loved their giant crawfish float. Sparta looked different this year. They had bigger floats and didn’t look as historic as in the past. Sparta is the first krewe each season to use traditional kerosene fueled flambeaux. 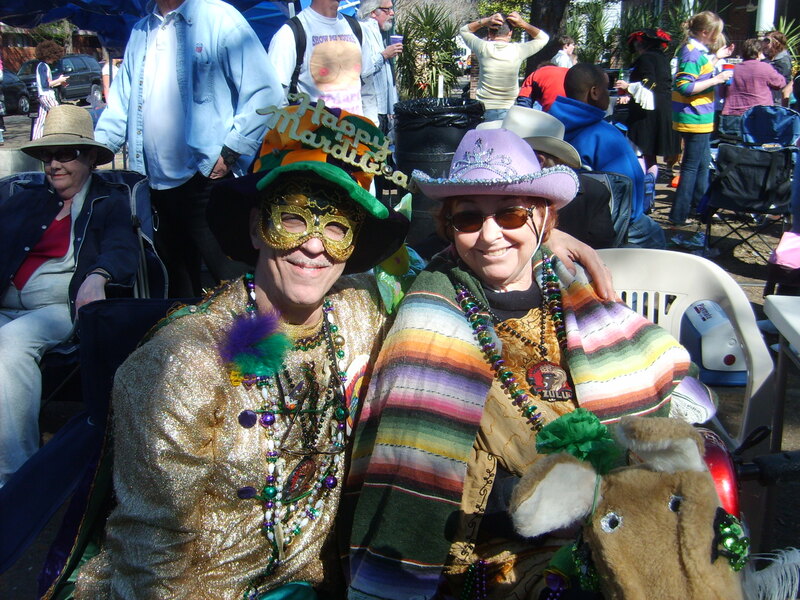 Pegasus is an open krewe that allows the public to join the krewe, ride in the parade, and attend krewe events and parties. Carrollton and King Arthur on the first Sunday are the only parades down St. Charles Avenue that day making it a very short weekend parade day. Babylon is the fully traditional parade of the season, and they were celebrating their 70th anniversary in 2009. Babylon has the look and feel of an old fashioned parade from a century ago. 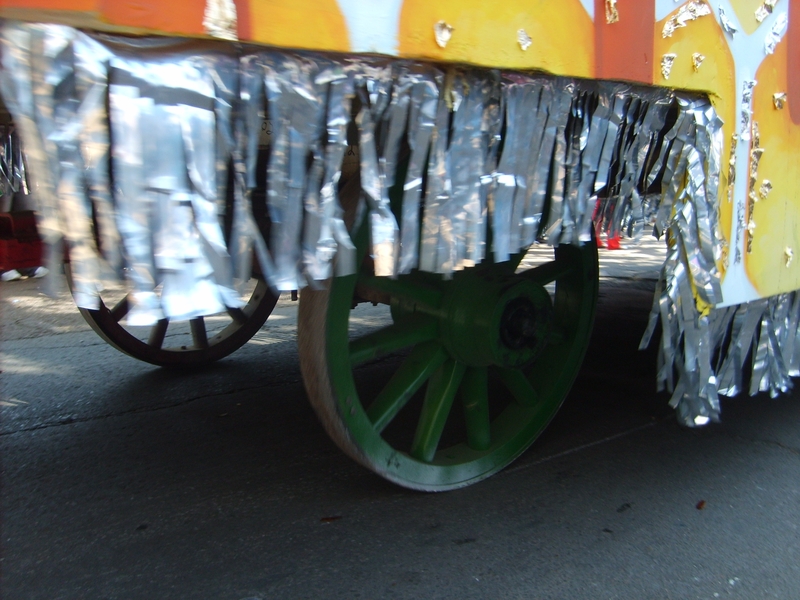 Many of their paper mache floats ride on wood wagon chassis and wooden wagon wheels and they utilize the original flambeaux made for Rex and Comus a long time ago. Muses, an all-female krewe, was simply the best parade of the season for a number of reasons:their huge advantage in the type and variety of their throws, their emphasis on the woman’s shoe as krewe emblem, and their far out marching groups like the Rolling Elvi, the Camel Toed Lady Steppers, Pussyfooters, and Bearded Oysters. A great article on the groups can be found in Where Y’at Magazine’s web site here . 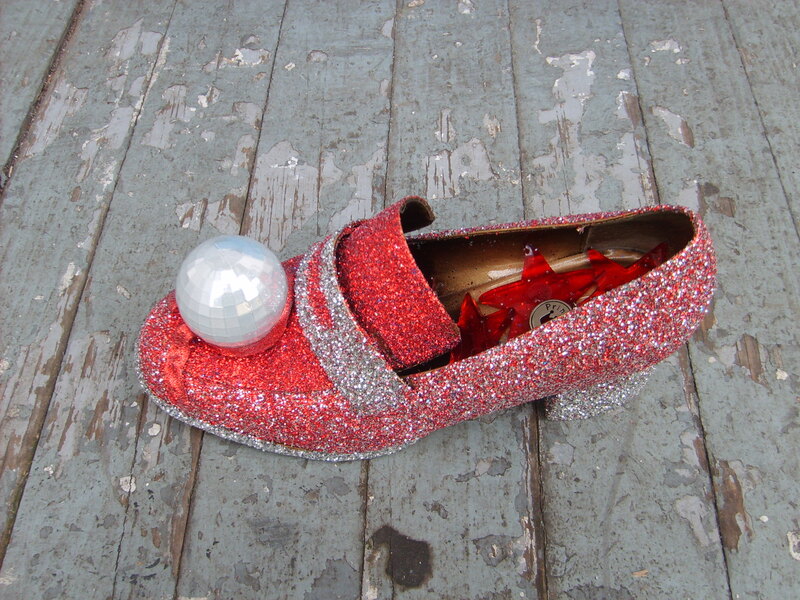 Muses has established their hand decorated woman’s shoe throw on a level that approaches the Zulu coconut. Chaos utilized a relatively new kerosene flambeaux that are not part of the original set made for the old krewes in the late 1800s. The older krewes wouldn’t allow newer krewes to use their original flambeaux, so an ingenious and crafty krewe Captain studied the original flambeaux and created very close copies that work similarly but apparently don’t violate any patent. Chaos was the first parade this season whose floats were made by Royal Artists, who make the some of the best traditional paper mache floats in all of Mardi Gras. Check out Royal Artists’ web site here . Hermes was the first parade on a three parade night, and the floats were made by Royal Artists, giving the parade a traditional paper mache look. Hermes utilizes the older flambeaux. D’Etat goes all out to promote their parade, putting up two different fliers on poles throughout the parade route. D’Etat was one of the very first krewes to toss large numbers of light up beads, one of the biggest trends in Carnival throws. E’tat had a really good looking 3-D krewe cup, the only 3-D cup that I saw all parade season. The 3-D cup uses lenticular technology. Morpheus also used the longer route, following D’Etat. Morpheus is only 8 years old, but they have a traditional look to them. The painting on Morpheus’ floats was different than the other krewes, and I found the style simple but pleasing. Iris is the oldest of the two all-female parading krewes, Muses being the other. Iris favors children with their throws. Tucks was formed by Loyola college students a few decades ago, and have kept their irreverent attitude. Their unique toilet float has been updated into the King’s float, keeping the porcelain fixture intact. One of the reasons I love Tucks is because I had my own float in Tucks for three years, at a time when Tucks solicited for floats to augment their parade. Endymion is the biggest of all ‘super krewes’ with over 2,000 riders. Kid Rock was their celebrity king, and before the parade, at the big Endymion block party, Kid Rock reprised his big summer hit, Sweet Home Alabama before a huge crowd. Endymion has the most riders, the biggest floats, the most throws, terrific bands, and the biggest crowds. Endymion began as a neighborhood parade in 1966, and morphed into a super krewe in 1974. They utilize a third type of flambeaux, a propane version.The original flambeaux design burns kerosene, and the system has always leaked. The kerosene is stored in a tank above the head of the flambeaux and gravity carries it down to the burners. I’m not sure who owns these.Okeanos celebrated their 60th anniversary this year. New this year, several krewes that historically started on Napoleon Avenue began their routes at Jefferson and Magazine Streets. Okeanos was the first to try out the route addition. Mid-City was the first parade to use colored foil to decorate their floats, and when the sun is shining, Mid-City’s floats look superlative. Mid-City has an old tradition, the “Greatest Bands in Dixie” contest for the bands that participate in the parade. Thoth has their own extra long route uptown, as they parade past hospitals and retirement homes. Thoth looked better than usual. 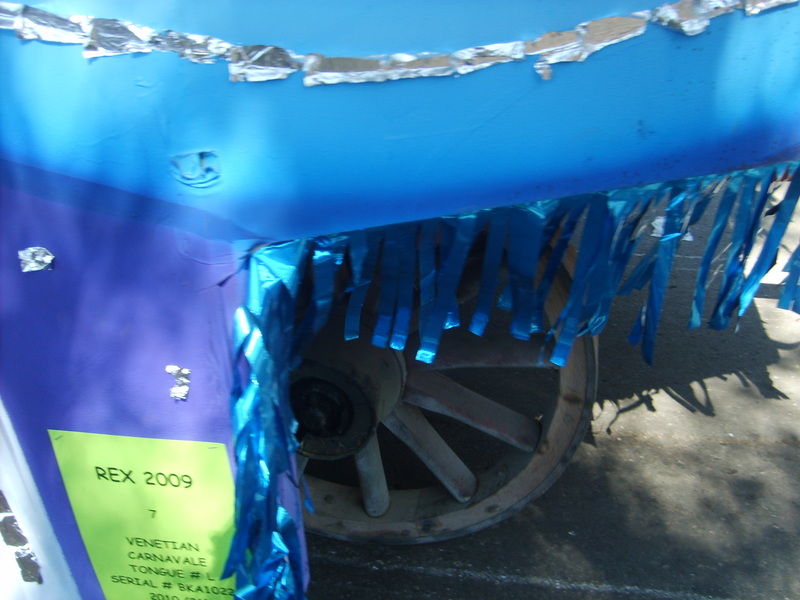 In the past they rented their floats from Hermes, and many times, their floats didn’t match the float titles. This year, they had better looking floats that weren’t Hermes. Bacchus, the original super krewe, was formed in 1968 as a super krewe. To our eyes, Bacchus looked a little smaller in 2009. 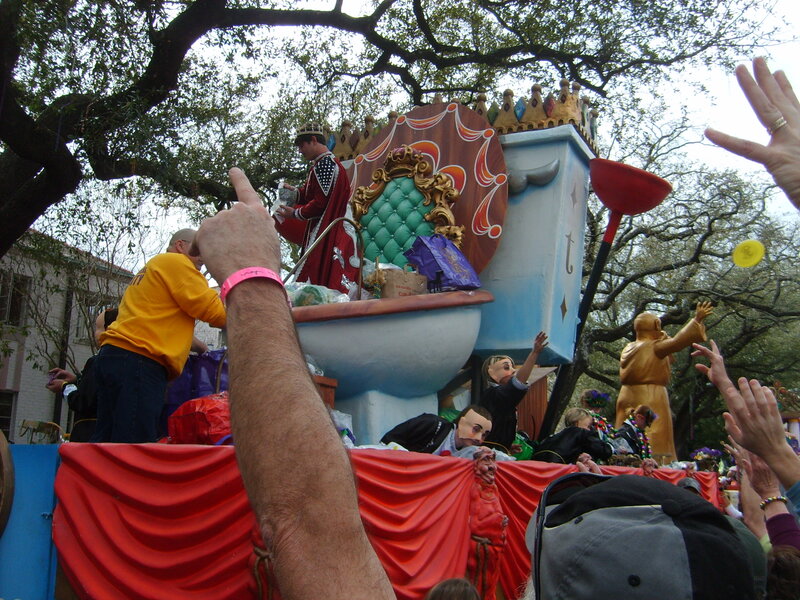 Bacchus was the first krewe to have a celebrity king each year, and they originated the huge super floats that contain dozens and dozens of riders. Today, there are 4 super krewes in New Orleans- Bacchus, Endymion, Rex, and Orpheus. On the West Bank, Alla qualifies as a super krewe, and in Metairie, Caesar does. Proteus began parading in 1881. They use the old wooden wagon chassis and wagon wheels, and the traditional flambeaux they started with over a century ago. I caught a light up seahorse medallion at the parade this year. Proteus is a good looking, traditional paper mache parade built by Royal Artists. The only two parading krewes from the 1800s now are Proteus and Rex. Comus, who began parading in 1857, and Momus, who started in 1872, stopped parading in 1992 after the New Orleans City Council, led by Dorothy Mae Taylor, passed an anti-discrimination ordinance. Proteus stopped parading at this time, but resumed parading in their old Monday night slot in 2000. Orpheus, the super krewe founded by singer/actor Harry Connick, Jr., looked a little less super in 2009. For one thing, after the first few floats, the bands ran out. Super Krewes find enough bands no matter what. While many of their floats were giant, gorgeous creations, many others were ordinary. Zulu celebrated their 100th anniversary in 2009, and to celebrate, their parade, perennially late, was actually early! That is a really big deal for Zulu. I received 5 coconuts after 1/2 of Zulu, which is more than I’ve ever received in over 30 Zulu parades. Today’s Zulu coconuts are improved, 4 of the 5 coconuts I received had the milk and meat removed. If you leave the milk and meat, the coconut often rots. Zulu led off their parade with the Edna Karr High School Band, which was a big switch. Historically, Karr hasn’t been known for leading off Zulu, but in this post-Katrina New Orleans, anything can happen. Rex, King of Carnival, was the first krewe to throw doubloons 50 years ago. Legend has it that Alvin Sharpe, inventor of the Mardi Gras Doubloon, proved the doubloon were safe enough to throw from the floats by tossing a handful at the Rex Captain’s face. When he was unhurt, the doubloon was launched into Mardi Gras throw history. The organization that puts on the Rex parade in called the School of Design. The line of throws thrown by Rex increased in recent years. Historically, Rex threw one type of medallion. This year, they had numerous varieties of logo beads, and two sizes of plush Boeuf Gras. In 2009, Rex didn’t look quite as royal as the King of Carnival should. They too suffered from a bad float/band ratio. Yes, it’s the end of Carnival, but Rex has surmounted this problem before, and I’m surprised and disappointed that they couldn’t obtain even close to enough bands. On St. Charles Avenue a few blocks from Napoleon Avenue, the crowd was lighter than usual. The crowd over the weekend on Bacchus Sunday was noticeably bigger. Yet there is no parade like Rex. They alone have the Boeuf Gras and Jester floats. These floats, along with the Rex King’s float, are the symbols of Carnival in New Orleans the world over. Mayor Nagin led Zulu this morning down Jackson Avenue on horseback. Zulu, celebrating its 100th anniversary, was early for the first time in recent memory. Nagin was wearing a Roman leather gladiator costume with no sleeves. I received 5 coconuts after the 12 or so Duke, Maid, past King/Queen, and Special Zulu position floats. 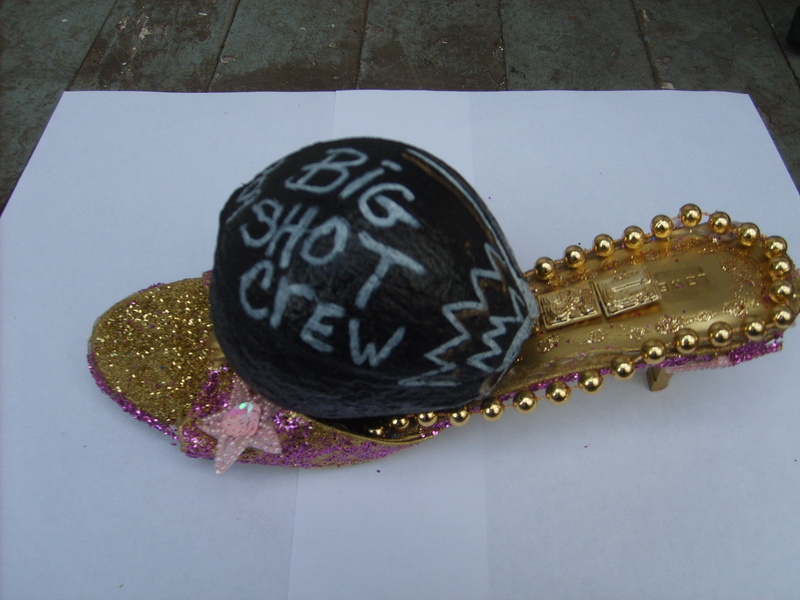 My favorite coconut this year is from the “Big Shot Crew” (see picture below). In the past, Zulu coconuts came with the coconut milk intact. Now, the milk is removed on most of the coconuts, which helps preserve them. 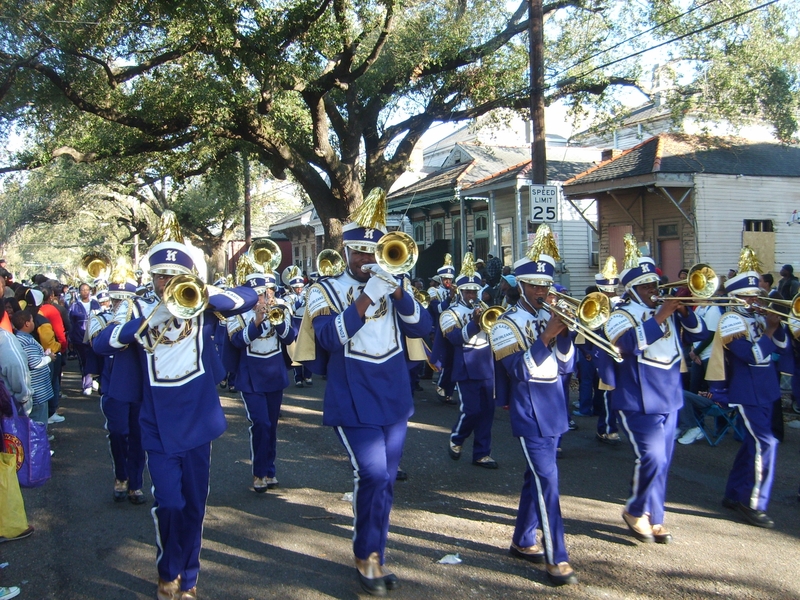 Zulu was led by New Orleans’ own Edna Karr High School. Since Katrina, there has been a change, mostly for the better, in high school marching bands. Edna Karr leading Zulu typifies this change. In the past, Edna Karr and Sara T. Reed’s bands were indifferent. Now they are approaching the same league as perennial powerhouses St. Augustine, McDonough 35, and in the female high schools, St. Mary Academy and Xavier Prep. I borrowed my son’s bicycle to travel from my parade headquarters on St. Charles Avenue to Jackson Avenue. I left Zulu when it was half over as I wanted time with my wife to see the sights on St. Charles Avenue before Rex. The crowd for Rex on St. Charles avenue between Napoleon and Louisiana Avenues was relatively light. This was very unexpected. It was heavier over the weekend, especially on Bacchus Sunday. 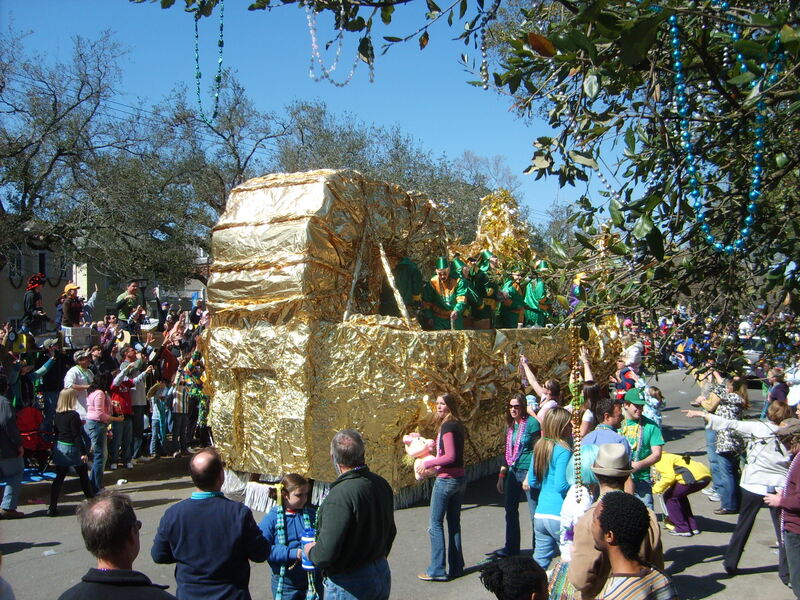 Bacchus Sunday is an all day affair, with parades from 11 am through 9 pm. Mardi Gras Day is from around 7 am to around 1 or 2 pm, when the trucks finish uptown. One of the coolest aspects of Rex is they are one of only two krewes that utilize wooden wagon wheels on wooden float carriages. Proteus the day before Rex is the only other krewe using old wooden wagons with wood-spoked wheels. The newest float beds of the older two krewes, ironically, belong to his majesty Rex, built in 1951 after the old Rex den on Calliope Street burned. The most unusual Carnival wheels that require a wheelwright are the light carriage wheels belong to the krewe of Napoleon’s mini-floats; these are built on the beds of buggies purchased from a French Quarter carriage company. Who maintains the wooden wheels? You need a master wheelwright, and the last one I knew who maintained the wheels for the oldest krewes was Earl Wyman. He’s long gone, so who does that job now? There are no listings for master wheelwrights in the New Orleans Yellow Pages. Rex has followed the recent trend of most New Orleans parading krewes of broadening out their throw selection. Rex has thrown plush Boeuf Gras the last few years. This year, they also threw a very large plush Boeuf Gras. For dozens of years, Rex threw a very basic, bland medallion. Now they have an entire line of Rex beads and medallions. They have thrown a standard 16 oz cup for years and now they have a second, more colorful, larger cup. Two of my favorite throws I caught for 2009 (see photo) were a Muses decorated shoe and the Big Shot Crew Zulu coconut. Muses had an couple of wild electric logo toys- a round mirror with lights and a fan that doesn’t cool very well but provides a very entertaining light show with the Muses name revolving and appearing & disappearing. The “Top Secret” throw, a poster sized print up with a description and likeness of all their floats, and amusing writings on each float. A shoe bracelet in the colors of silver, red and black. A light up crystal necklace that blinks and is heart shaped. Still sealed in package, with an “M” on it. A light up blinking bead still sealed. It says “Muses 009 License to Swill” on it. A stuffed alligator with Muses written on it. A hard to get hand-held fan to cool you off in summer. When the soft blades go around the word “Muses” lights up and revolves several ways. Very cool. A Muses street sign bead. A light up ring, just twist to activate blinking. Combination light up flashlight/bottle opener. And the big prize throw- the highly coveted radio, including neckstrap, ear buds, and automatically scans to pick up all stations. The traditional Mardi Gras ball is venerable institution in Carnival society, often following a stylized routine that began well over a century ago. For many years, the balls of older Krewes took place in the Municipal Auditorium. Since Hurricane Katrina, the Morris F.X. Jeff, Sr. Municipal Auditorium still festers un-renovated, even though next door, the Mahalia Jackson Theater of the Performing Arts has been restored beautifully. For 2009, Rex will hold its ball in the Sheraton Hotel on Canal Street in the French Quarter. Most balls are slated to begin at 9 pm and valets often with years of experience, help the riders with their change of clothes. Many Krewes have to hurry because there is only a short period of time between the end of the parade and the start of the ball. Receiving an invitation to a Krewe ball, especially an old line club like Rex or Comus, is a social coup of major proportions, as there are only a very limited number of invitations and attendance is by invitation only. There are two levels of guests, those whose invitations specifies balcony seating and those who are spectators only; those who have a “callout” card enclosed in their invitation have floor seating and are allowed to dance as they are “called out” by members of the Krewe. This procedure is rigidly set in tradition. As a Krewe member decides on a dance partner he whispers her name to a “committeeman” who then escorts the lady to the floor. A favor is customarily given to the lady by the Krewe member after the first dance. The primary reason for holding a traditional ball, however, is not dancing. The highlight of the ball is the tableau; the auditorium is decorated, often lavishly, and the King and Queen are seated on the dais “reigning” over the proceedings. The court is then presented in an elaborate pageant. Drinking is not allowed on the floor of the tableau balls although refreshments are usually available backstage. The festivities are usually over by midnight. Tradition is changing, somewhat, as newer Krewes have more interest in socializing and less in tableaux presentations. Dinner dances, potluck and cocktail parties have gained in popularity, and a few large Krewes such as Bacchus, Zulu, Orpheus, and Endymion stage huge extravaganzas with national entertainment. Even Rex has changed, allowing all guests onto the dance floor after a specified time. Throw innovation is only one of the games of Muses, the largest and baddest of all the woman’s krewes. In their prime in the mid 1980s, Shangri La in Chalmette was a mighty all-female krewe, with over 1,000 members. However, their membership declined since Katrina, and chose not to parade in 2009. Muses began parading as an all-female krewe in 2001. Staci Rosenberg is founder and captain of Muses. In just eight short years, Muses is at the absolute top of the New Orleans krewes in terms of creativity and numbers of throws. No other krewe comes close to matching the depth and breadth of their throws. They also are one of the largest krewes in terms of membership, with 1,500 members. No other krewe comes close to the number and variety of personalized throws that Muses throws. I’ve seen the short published list of new throws for 2009, and I’m sure it is very incomplete. Muses do not publish their full list before the parade.